Bailey Chen is fresh out of college with all the usual new-adult demons: no cash, no job offers, and an awkward relationship with Zane, the old friend she kinda-sorta hooked up with during high school. But when Zane introduces Bailey to his monster-fighting bartender friends, her demons become a lot more literal. It turns out evil creatures stalk the city streets after hours, and they can only be hunted with the help of magically mixed cocktails: vodka grants super strength, whiskey offers the power of telekinesis, and tequila lets its drinker fire blasts of elemental energy. But will all of these powers be enough for Bailey to halt a mysterious rash of gruesome deaths? And what will she do when the safety of a "real world" job beckons? This sharp and funny urban fantasy is perfect for fans of Buffy the Vampire Slayer, Scott Pilgrim vs. the World, and grown-up readers of Harry Potter. Includes fifteen recipes from a book of ancient cocktail lore. 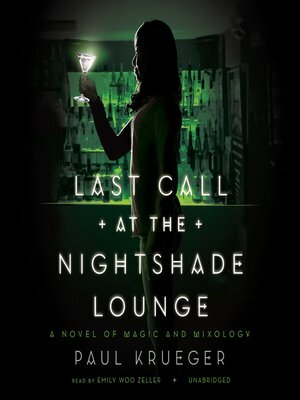 Paul Krueger is a fantasy writer and avid cocktail connoisseur whose work has appeared in the Sword & Laser Anthology. He lives in Los Angeles.